An important part of raising chickens or owning a chicken coop is understanding how to recognize and treat common chicken diseases and illnesses. Understanding how and what chicken diseases are common can help teach you how to tell if your chicken is sick so you can keep your birds in their best shape and health as they grow. Below are some of the most common types of chicken illnesses and diseases that you should be familiar with. 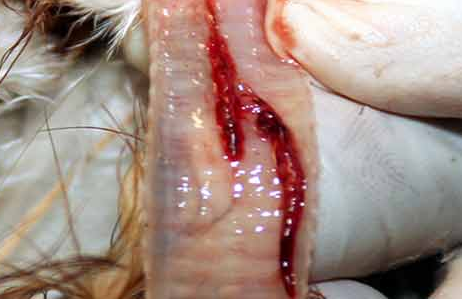 Ascarids are large, parasitic intestinal roundworms and are the most common to occur in chickens. Adult worms can be up to 3 inches long and are the size of pencil lead and are visible to the naked eye. When chickens are infected with intestinal worms, they begin to show signs of droopiness, emaciation and diarrhea. Specimens of this parasite are occasionally found in eggs, while chickens that are three to four months old will show resistance to the worms. Worms wander from the intestine up the oviduct and merge into the egg as it forms. Female chickens will lay thick heavy-shelled eggs in the intestine that pass in the feces. A small embryo develops in the egg but does not hatch immediately. The larvae in the egg reaches infective stage within two to three weeks. Disinfectants and other cleaning agents do not kill eggs under farm conditions. Birds become infected by eating eggs that have reached the infective stage. The treatment that is most common is piperazine. The parasite can be controlled by maintaining strict sanitation of your chicken coop. Keep birds confined and thoroughly cleaned before exposing them to new birds. The best way to do this is by separating birds by age and making sure young birds have a clean and sanitized area. Syngamus trachea, or gapeworm, is a round red worm that attaches itself to the windpipe of a chicken and causes open-mouth breathing in affected birds. Gapeworms are especially harmful to younger chickens. A gape worm is red and shaped like the letter Y, as the male and female worms are joined in permanent copulation with their mouthparts and attached to the lining of the trachea. Chickens with severe infections emit a grunting sound due to their difficulty breathing, and this can lead to suffocation because their trachea is blocked by the worm. They are often consumed by birds who eat earthworms infected with gapeworm larvae. Once consumed, gapeworm larvae hatch in the intestine and migrate to the trachea and lungs. The best preventative measure you can take to prevent gapeworms is to administer wormer at 15- to 30-day intervals or including a drug at low levels, such as fenbendazole, continuously beginning 15 days after birds are placed in the infected pens. A serious poultry mite is the Northern Fowl Mite. It can cause retarded growth, reduced egg production, lowered vitality, scabby skin, damaged plumage and death. This specific mite remains on the bird and does more damage than any other species of mite. Northern Fowl Mites are extremely small and need a magnifying glass to be seen. They are usually present in large numbers on chickens. They prefer the feathers below the vent and around the tail but can be found on all parts of the body. 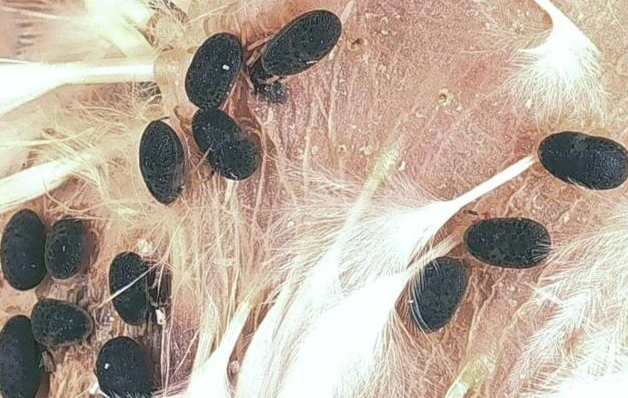 Another common type of mite is the Common Chicken Mite, Dermanyssus gallinae, a blood-sucking mite that is also present in large numbers and causes loss of blood, skin irritation and low egg productivity. 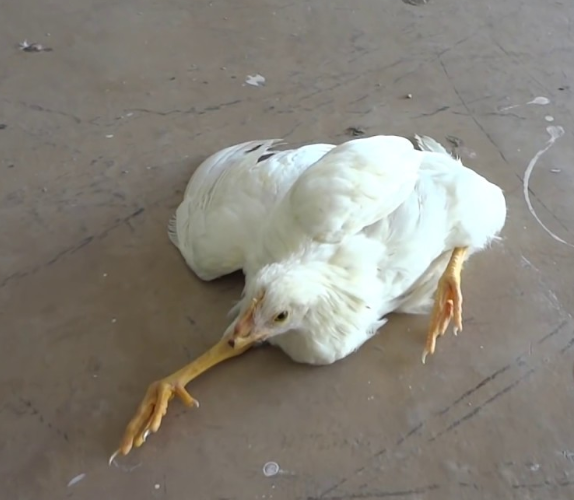 They can live four to five months in a coop, even after the birds are removed. The quickest way to tell if your chickens or hens are suffering from poultry mites are to do visual inspections. Because of their size, you’ll need the help of a magnifying glass. For large flocks, it’s best to keep an eye on egg production, the color of their combs and wattles, and thinning feathers, as chickens will over-preen in an effort to get some relief from the mites. Treatment is necessary to remove these mites since they remain on the bird most of the time. The best way to prevent mites is to do regular inspections and spraying of chickens and their den. Spraying their den will remove mites hiding in small cracks and crevices. Spraying treatments should be repeated on a one- to two-month schedule to prevent mites or done regularly when mites are present. Argas persicus is a serious parasite of poultry when left untreated and allowed to populate. Fowl ticks are blood-sucking parasites also known as blue bug. Ticks cause weakened chickens, low egg production, emaciation and death. Fowl ticks are most common in the South, can remain alive without food for more than three years and will feed on all fowl. Treating ticks is difficult, and treatment should focus on houses and surrounding areas. Seeking the professional help of pest removers is often the best solution to ensuring that all ticks are removed from the small nooks and crannies of chicken housing. Avian Pox is a slow-spreading viral disease that is found in birds of all ages. Fowl pox can be transmitted by direct or indirect contact and can be transmitted through mosquitoes. 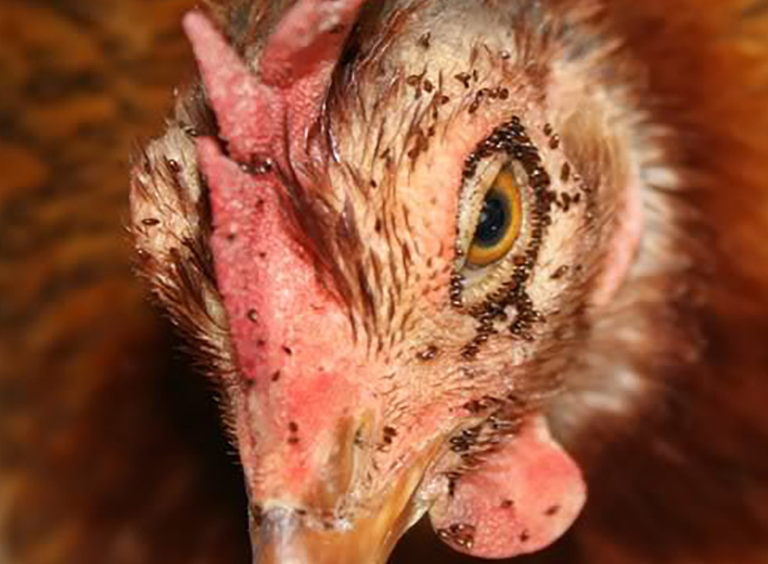 Fowl pox can live for months on contaminated surfaces in the right conditions and is highly resistant in dried scabs. Affected young birds can have stunted growth while laying birds experience a drop in egg productivity. Birds of all ages may have oral or respiratory system difficulty while eating and breathing. The disease manifests itself in one or two ways: cutaneous pox (dry form) or diphtheritic pox (wet form). Dry pox is characterized by small, whitish foci that develop into wart-like nodules. The nodules eventually are sloughed, and scab formation precedes final healing. Lesions are most commonly seen on the featherless parts of the body, such as the comb, wattles, ear lobes, eyes and sometimes the feet. Wet pox is associated with the larynx and trachea. The lesions are diphtheritic in character and involve the mucous membranes to such a degree that, when removed, an ulcerated or eroded area is left. Vaccination as young as one day of age can help prevent Avian pox, but there is no treatment for Avian Pox. Vaccinations when used properly can be preventive and affective. One application of fowl pox vaccine is all that is needed for permanent immunity. Newcastle is a highly contagious viral infection that causes respiratory nervous disorder in chickens. Some strains can cause nervous disorder, visceral lesions and death. All birds in a coop can be infected within three to four days. The virus is transmitted by contaminated equipment, shoes, clothing, free-flying birds and through the air. The most common symptoms are nasal discharge, excessive mucus in the trachea, cloudy air sacs, casts in the air passages of the lungs and cloudiness in the cornea of eyes. Symptoms for Newcastle are similar to Infectious Bronchitis (below). Vaccination is the best preventive measure you can take. The most common vaccination used is B1 and La Sota types.The vaccine is administered by drops into the nostril or eye, and added to drinking water or applied in a spray form. Also a common and extremely contagious respiratory disease of chicken, infectious bronchitis only affects chickens and is considered the most contagious of poultry diseases. Infectious bronchitis causes nasal discharge, difficulty breathing, gasping, sneezing and rales. Symptoms usually last 10 to 14 days in a flock but can last longer. Baby chickens three weeks and under often experience mortality as a result of catching infectious bronchitis. There is no treatment for this disease, but there are several vaccines available commercially. All vaccines contain live virus, and those that give the best protection are also capable of producing symptoms and reducing egg production. 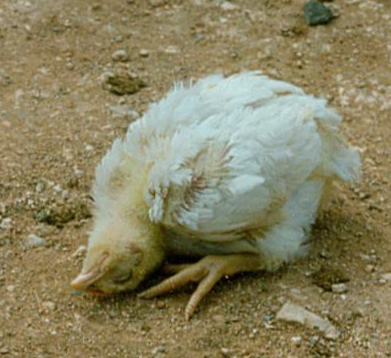 The vaccine, because it contains a live virus, can be spread to other susceptible birds. Vaccines are generally administered through drops into the eye or nostril and then added to drinking water. 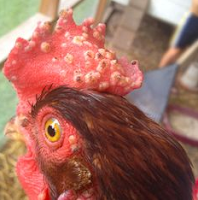 Marek’s Disease, also known as Visceral Leukosis, is a disease that’s commonly found in young chickens from age 12 to 25 weeks but can also infect older birds. Marek’s disease is caused by a virus that belongs to the Herpes virus group and is spread through the inhalation of feather dander and dust that is contaminated with the virus. This disease can also be spread by the excretion of infected chicken waste. Marek’s is a type of an avian cancer that is similar to lymphoid leukosis. Marke’s causes tumors in nerves that can result in paralysis. Tumors can form in the eyes, liver, kidney, spleen gonads, pancreas, muscles and skin. Tumors can cause irregularly shaped pupils, blindness, ataxia, paleness, weak and labored breathing, enlarged feather follicles, emaciation, scaly combs, the inability to use or raise wings, and greenish diarrhea. The best preventable measure is vaccination. All newly hatched birds should be vaccinated for Marek’s disease by following the manufacturer’s recommendation and administering it in a sterile environment. There are no treatments for Marek’s disease. 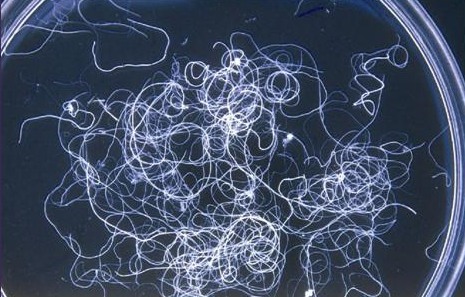 Botulism is caused by the ingestion of a toxin produced by the Clostridium botulinum bacteria. It’s not a bacterial infection but a condition caused by the byproduct of the presence of the bacteria and its growth. 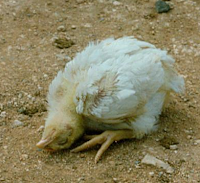 The organism only becomes harmful to poultry when soil conditions favor its growth and subsequent toxin formation. Areas that promote growth are often high in humidity, high temperature and decaying organic matter (plant or animal). This organism also grows best in stagnant pools of water or damp areas where buried decaying matter are a danger for toxin development. Insects that feed off decaying carcasses are a common source of the toxin and, if ingested by chickens, can infect the bird. Birds will begin to appear weak, and this is accompanied by a progressive flaccid paralysis of the neck which causes the head to hang limp. Birds can experience tremblin, loose feathers and dull, partly closed eyes. Due to their limp neck, they’re ability to swallow is limited and mucous develops in the mouth. Remove affected birds from the flock and locate and remove the source of the toxin. Place sick birds in a cool shaded area and give fresh water into the crop twice daily. Mild laxatives may be used for birds that have been exposed but do not show disease symptoms. Epsom salts (one pound per 100 birds) may be mixed into feed as well. Adding a level teaspoonful of Epsom salts into one ounce of water for sick birds can help improve symptoms and recovery. There are many other illnesses and diseases that chickens can catch, but these are some of the more commonly occurring ones. Staying vigilant and aware of your flock will allow you to notice small changes in their behaviors and appearance. If you do start to notice changes in your flock, act quickly to ensure that illnesses and diseases don’t spread, and reach out to veterinary professionals for help. Treating chicken diseases early will get them healthy while preventing detrimental and irreversible damage to the rest of your flock.